It was just sitting there all alone. Oh my gosh, that is so cute and looks like something those blog people find but I never do...yet here it is right in front of my eyes. (Now, being the goody goody that I am, I did ask inside the school if it belonged to the school. No, it didn't, followed by chuckles was the response I got. Now, I know about half of you wouldn't do a thing to it and the other half would strip, sand, paint, distress, paint again, distress again and seal. (A few of you might not of picked it up.) I am somewhere in the middle. I loved it as is except for one thing. I don't like the wicker stuff in the middle at all. I can hear about half of you saying "that's the best part" and the other half saying "yep, that's pretty yucky ugly." Close up...see? I don't like it...at all! Besides, it was soooo dirty and I don't think I could clean this part to my satisfaction. Who knows where this table has been. So, off with the wicker! Most of it could be pulled up by hand and the rest was scraped. What was underneath was worse. It was wood but with a permanent impression of that wicker. So, here's my solution. A little burlap can fix anything. So, I cut some burlap to fit and used a little dab of glue to glue it down. Next, a little jute twine around the edges to finish it a little (yep, just glued it too). See, it's already looking better! I like the burlap and jute twine lots, lots better than the yucky wicker. Ready to see the finished project? 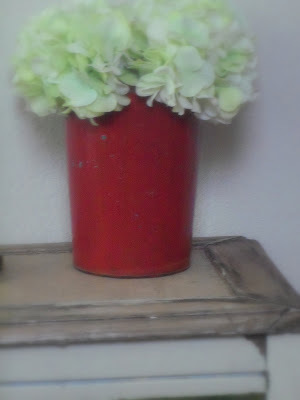 Here it is and all for free since the table was free and I had burlap and twine laying around the house. Doesn't everybody? 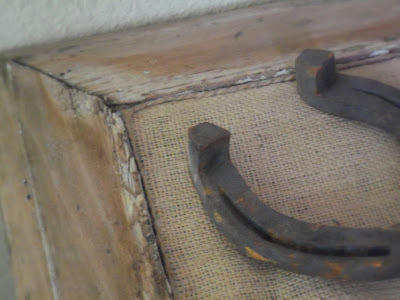 Top it off with a big old rusty horseshoe for a little Texas style cottage flair. I'm so happy with it, I may link it up with a couple of my favorite link parties listed below on the right or up above on my list. Pretty cute is right! A great find! Love it! OK, so my daughter is here with me and we can never find good CRAP like yours. I guess we need to keep our eyes open. Great find. We just finished burlap pillows. What a great find!!! You did great replacing that yukky wicker and adding the burlap. Very nice...Also love the horseshoe. I love it Gina! I'm with you. The only thing I didn't like was the wicker. So smart! Now it's purrrfect. Cute table. What a great find! Good heavens...how do you do that? I have no ability to do that! If I find junk with potential, I'm never able to reach the "potential" part. The poor junk just stays junk. Great find. And the burlap was a great idea. I love how it turned out. You are one lucky girl - the table is sooo cute. I was thinking burlap the minute I saw it, so I'm glad you put that in the centre part. I would have too. Now I'm the only one who doesn't find fabulous things just lying around. Congrats on finding the table! I love what you did with it! I love how you rescued that little table and the burlap and twine was the perfect finishing touch. Great transformation. Great find! Love the little red bucket on it. Definitely cute! What a great find! Wow, you should be proud! That looks fantastic! The burlap was the perfect solution, very clever! 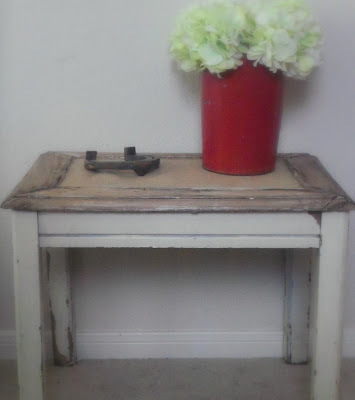 Cute little table and a nice spruce up, you can't beat free! That was a good idea - very cute! Dropping by from BNOTP, #7. Very cute! So glad you salvaged it! OMG I love it!!! That is a great curbside find!! Great find and much better! That is totally cute, I love the burlap. Lucky you on that find! absolutely delightful! full of charm! Awesome find! And great makeover! Yep adorable little table. And I would have gotten rid of the wicker too. Way too yucky in my book. What a great find! So happy for you finding it and what a great little gem it was transformed into now. Love it! I really like how you set up the display with the horseshoe. I love finding stuff! It has only happened to me once, a dining room table by the dumpster at work. Don't you know I always look there now, but nothing else has shown up...yet! Now that's a road side find! :) Great job revamping! Oh lucky you! That is so great, and I really like what you did with it! Nice job! I love what you did with your little discovery!!! This is my first visit and I love it here...signed up to follow! Great find at a great price with a fun story behind it! What could be better? I love this table! so glad I found your blog!!! I love life's little surprise gifts! Fabulous! Wow, it looks great! What a change and lovely table now! What a cool table! Good for you. I love your solution of using the burlap and twine. It turned out great. Your table turned out great! Congratulations on your Great find. That is too cool!! What a great and lucky find and I love how you "re-did" it! Thanks for linking up to We Can Do It Cheaper! You are so lucky! What a great find. And I love how creative you were to fix the top. Great thinking! Your table turned out great! Awesome find! This is so cute! 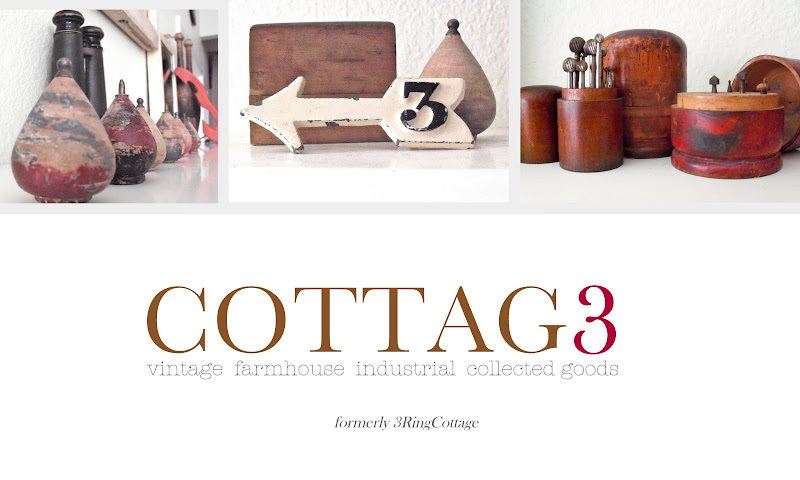 the perfect little table for a cottage look! Love the burlap top! So cute! Great find. Good for you for grabbing it and turning it into something! I love this little table! You did a great job giving it new life. Love the burlap! The burlap is definitely an improvement over the wicker. You were wise to remove the wicker! It would have been ok if it had been in better shape. 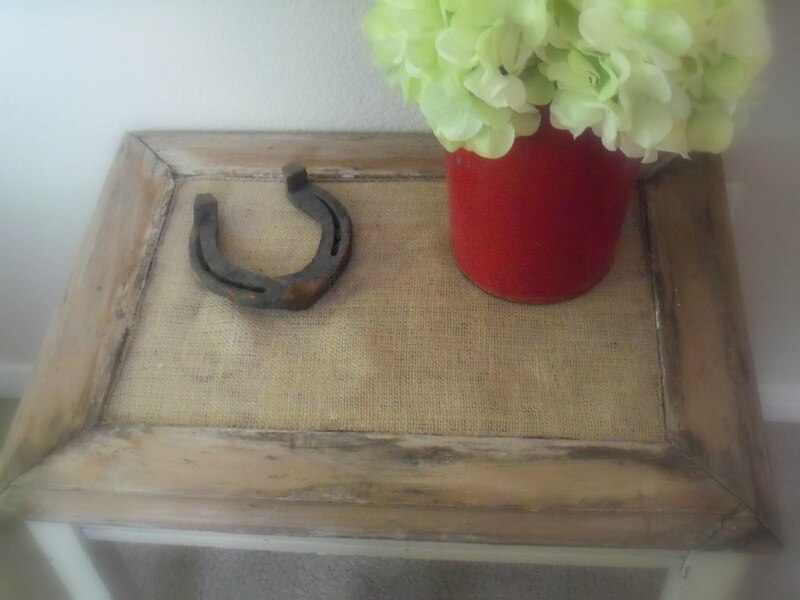 The burlap is a nice addition and adds texture to an otherwise plain piece. It looks great!